Keith K. Hilbig was sustained a General Authority and member of the First Quorum of the Seventy of The Church of Jesus Christ of Latter-day Saints on April 1, 2006. 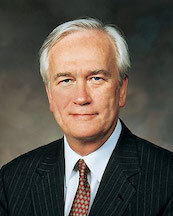 He served in the Second Quorum of the Seventy from 2001 to 2006 and also served as an Area Authority. He was granted emeritus status in 2012. He had been placed on medical leave in 2010 due to impairment from Alzheimer’s. Hilbig was born on March 13, 1942, in Milwaukee, Wisconsin. He earned his bachelor’s degree in European history from Princeton University and his juris doctorate degree from Duke University. He was a trial attorney in Los Angeles, California, before forming his own law firm. In April 1998, he left his firm to become international counsel for the Church and was stationed in Frankfurt, Germany. He had responsibility for about 40 countries. He has served in the Church as a full-time missionary, seminary teacher, Young Men president, elders quorum president, bishop, high councilor, and temple ordinance worker. He presided over the Switzerland Zurich Mission from 1989 to 1992. He passed away on August 22, 2017. He and his wife, Susan, were the parents of six children. This page was last edited on 6 September 2017, at 13:49.